After I added a tag to the last post, about the ocotillo, I realized that Fouquieria columnaris is the cirio or Boojum Tree of Baja California, and ocotillo is F. splendens. Some botanists put the boojum in a separate genus, Idria, no doubt because the name is easier to pronounce. If I lived in southern California I would have a lawn of boojums. Here, it’s a house plant, of course, and the one pictured lost half of itself when it was knocked to the floor in one of the many mishaps that have befallen my collection of similar plants. The first one we owned was a much smaller plant, and spent the summer sitting on the cart, since I figured that sun and fresh air would do it good. Then one day it disappeared. Squirrels are the usual suspects of mischief like this, though they seem to prefer snatching sempervivums and ice plants. I pictured the poor boojum hanging from a branch in the Austrian pine, pulled out of its pot by an ancestor of the squirrel who has now suddenly taken to draining the hummingbird feeder and running around in a sugar-crazed fit, or torn to pieces and left to die on the patio because it was too spiny to eat. We looked all over the patio for it, looked up in the air at the pine, wandered around the garden, calling out its name. No boojum. Then, about a month later, our first border collie walked up to us, wagging his tail, and I noticed something stuck in the “feathers”. It was the boojum tree. It must have been snagged as the dog walked by the cart. No wonder it didn’t come when it was called. 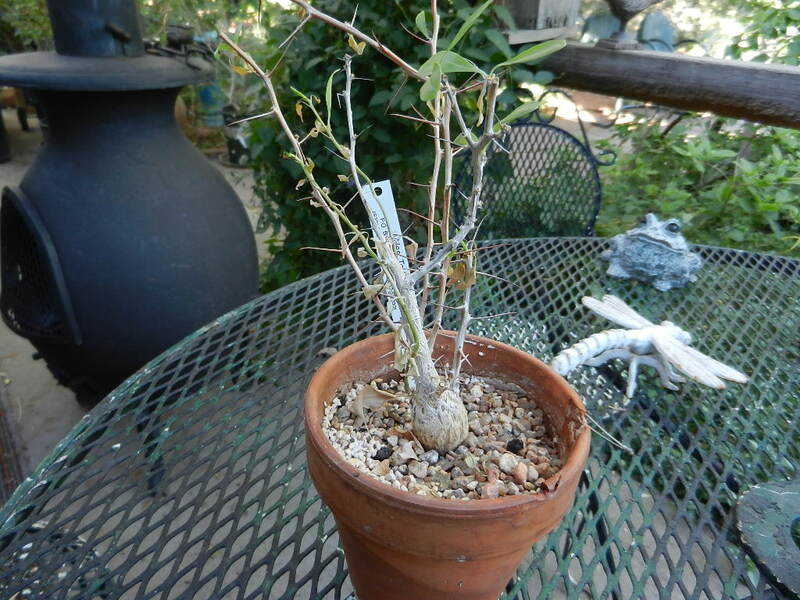 This entry was posted in Uncategorized and tagged boojum, cirio, Fouquieria columnaris, Idria columnaris. Bookmark the permalink.